AMD's forthcoming Zen-based chips will put an end to the multi-socket madness of today's FX chips and AMD APUs. After years of shipping a legion of CPUs and APUs for a multitude of different motherboard sockets, AMD is streamlining matters with the launch of its forthcoming processors. AMD’s Zen-based CPUs and APUs—codenamed “Summit Ridge” and “Bristol Ridge,” respectively—will both feature a fully integrated system-on-a-chip design and share the same socket, dubbed AM4. That sound you just heard was a million AMD enthusiasts breathing a sigh of relief in unison. As the above AMD-supplied slide shows, the fragmented nature of AMD’s current platform sockets can be a major headache for would-be system builders. Moving everything to a single socket eliminates that in one fell swoop. During my CES briefing with AMD, product manager James Prior stressed repeatedly that the company’s chip division is listening to customers and rushing to settle their frustrations; witness the new Wraith stock cooler, which is far quieter than AMD’s noisy old stock cooler. The Radeon Technologies Group has been singing a similar tune for years now, recently rolling out totally overhauled software and stepping up the pace of its driver releases. The Zen architecture promises to deliver 40 percent more instructions per clock than today’s Excavator cores by embracing a simultaneous multi-threading (SMT) architecture design similar to that of Intel’s Core series rather than the cluster-based multi-threading (CMT) approach AMD adopted for its Bulldozer/Excavator CPUs. 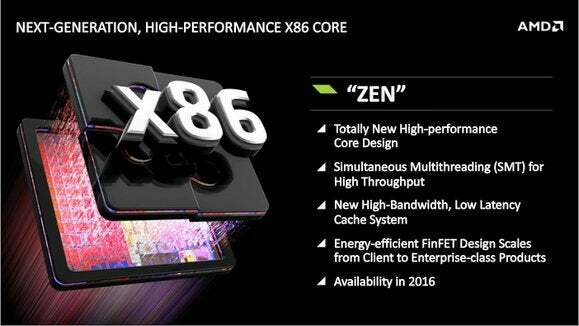 Zen will also introduce support for DDR4 RAM. Look for the first Zen chips to land sometime in the fourth quarter of 2016.